It’s been a long time. I shouldn’t have left you. That intro either shows off my age or makes me hip. That’s what the cool kids say, right? Anyhow, welcome back to my cosplay corner of positivity and geekiness! I’ve been away for a while, having been on a roller-coaster ride of cosplay, artist alleys, conventions, and meeting a lot of amazing people along the way. 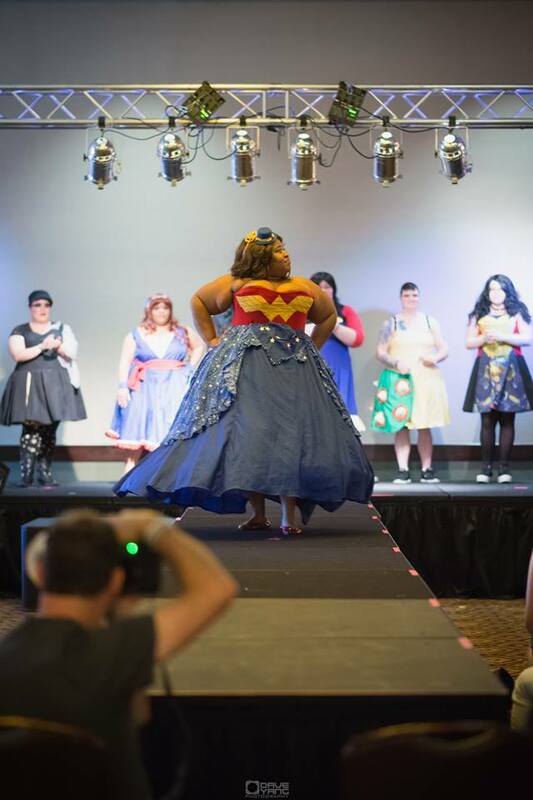 While going through my convention marathon, I’ve been spreading the cosplay-positivity love, whether it’s been coming from my table, wandering through the convention halls, or even giving my panel, “Love Your Cosplay Body.” The way my panel works is that I give a bit of my origin story and talk about the positives I’ve experienced in the cosplay community, the negatives, and how to deal with those negatives that may come your way. This is broken into a series of steps followed by nifty slides and hopefully witty commentary from me (spoiler: I’m not that witty). However, while putting together the panel, I realized something thanks to things people have said to me online and in person. At first, I took it as a compliment, but then . . . I noticed something. I noticed how sad some people would sound when they said it to me, some even adding a defeated “I’ll never have your confidence” to that above statement. That’s when I realized that some people may look at me and think that I’m confident all the time and that there’s something wrong with them if they don’t have that same confidence. That’s why I have to admit the truth: I’m not always confident. In fact, no one is, and you know what? 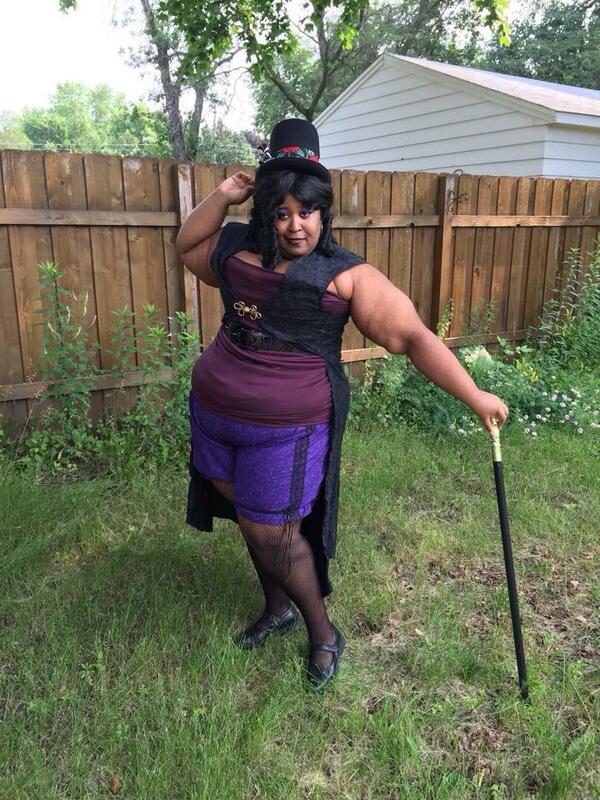 That’s OK. It’s OK to not be OK.
As Dr. Facilier from The Princess and the Frog, the first time I’ve done a cosplay with fishnets and shorts. And you know what? Sometimes, that voice in my head is right. Sometimes, I do get made fun of. And as confident as I am, I do have my bad days. There are times when a comment (or a series of comments) hits at just the right moment to really, really hurt me. I get upset. I have negative thoughts about myself. I consider stopping with cosplay. I curl up in bed. I even cry. This may surprise people, since my page is all about love and positivity and being confident in yourself—and those things are important. But there’s nothing wrong if you feel the other side of it, because honestly, you probably will sometimes. No one likes to be made fun of. No one likes to be bullied. And not everyone can have a sassy comeback in an instant when those harsh comments are made. I certainly don’t. Not all the time, at least; some days I’m like a rock star and can be on point with the bullies. But other days, I need to sit and blink the tears away before I take a few deep breaths and either attempt to say something or step away from my computer. And that’s perfectly OK. It’s perfectly normal. There’s nothing wrong with you for having these feelings and reactions. And they don’t always necessarily happen during the bullying. Sometimes, they’re delayed, happening after you’ve already stood up for yourself. I’ve gone back and forth with bullies on my Tumblr page before and have had people cheering me on . . . only to, many hours later, curl up in bed, emotionally drained and wondering why people felt the need to harass me. 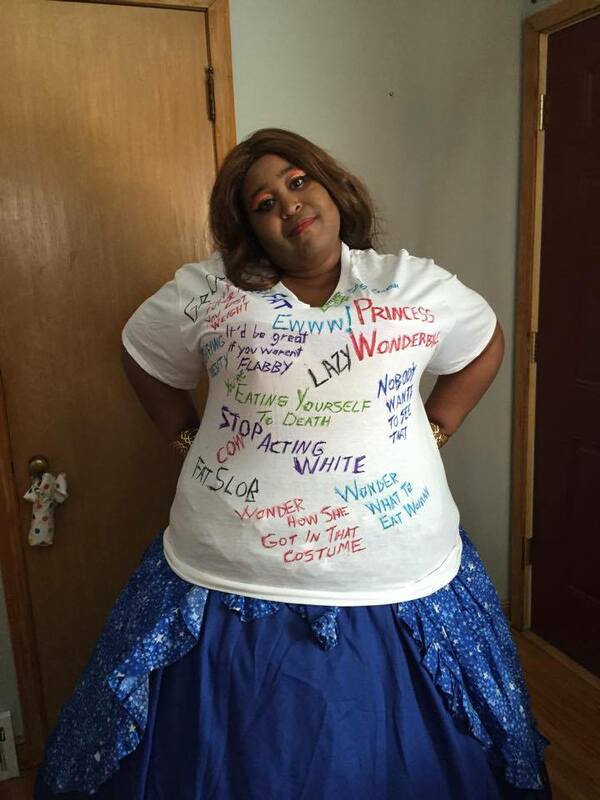 Me in a shirt that shows just a small handful of things that have been said about me. So then the question becomes, “How do you become OK again?” Because while it may be perfectly normal to feel insecure, it’s not a place you want to stay. You don’t want to stay in that downward spiral. The trick is to not constantly focus on the negative . . . which is definitely easier said than done. It’s really easy to focus on that one bad thing because, in a room full of positives, that one negative ends up feeling like the loudest thing there. So the trick is to drown out that one loud negative with a lot of positives. The reason why I can bounce back is because I not only think of the positives but surround myself with them. I talk to my partner, and she cheers me up. I talk to my mom, and she makes me laugh about the idiotic comments that are made on the Internet. I work on something that puts a smile on my face or do something that makes me feel happy. If I get a negative comment on a picture, I go back and look at the positive ones. I stop and realize that against one negative, a picture may have hundreds, even thousands, of positives on it. I stop and think about how much fun I have when I cosplay, and how much I enjoy doing this. By doing that, I pull myself away from the bad and let the good take over. But it’s really, really important to do this at your own pace. Don’t force yourself back out there if you’re not feeling it. It’s OK if you’re not there yet—just don’t stay in that negative space. As a final thought on all of this, you don’t always have to engage with the negative that’s happening. If you’re the type of person who can respond to bullying and it makes you feel better to do so, then go for it. If you’re the type of person who does better by walking away from it, then do that. If you can only respond for so long before you need to stop, then stop. Do what’s best for you and your well-being. It’s OK to not be OK, because you will reach a point where you will be OK. This is so inspiring. I’ve always wanted to cosplay but never had the guts. Every time I’ve made an attempt to start something I get bad anxiety and give up, looking at women like you and thinking, “Why can’t I just be fearless like that? Why do I cry over internet comments when other people never seem to?” I guess I’m not the only one. I do indeed, I live in St. Paul. And your response is why I wanted to write this. I am pretty confident but I also have moments where I completely crumble, the trick is to not stay in that downward spiral and to focus on the positives of cosplay, which is first, and foremost, to have fun 🙂 If you want to cosplay, go for it! And Meow has a great point, you can always start small and just do it at home or with friends if you aren’t ready to do it at a con. 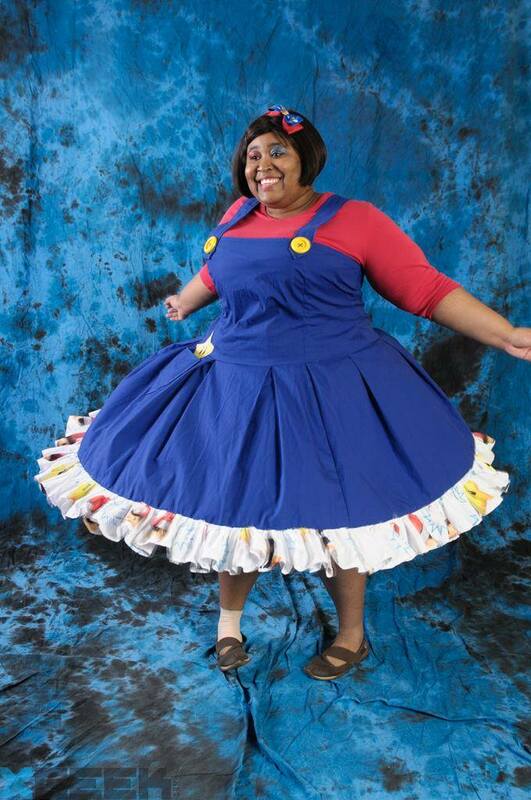 I want to know where you got the Mario outfit/if you made it. It looks exactly like a concept I had for a female Wario and I LURV ITTTTTTTTTTTTTT! Did you make it yourself? Thank you for posting this. I really needed to see this today, for reasons unrelated to cosplay. We’ve never really talked, but I’ve seen you in your wonderful costumes, and you always look amazing (and you and your partner look so sweet together; good for you!). Keep cosplaying, and keep smiling. Thank you so much! And thank you for the support 🙂 I’m glad this helped you today. Thank you so much *hugs* And I am sending good vibes your way! You can definitely rock that cosplay <3 Just go out there and have fun! My husband and I met you and your partner at NoBrandCon this year (we were Mei Rin and Bardroy) you were both amazing and beautiful! I love everything about the 2 of you and you were beyond kind to us even in passing. We as nerds, geeks, etc should realize of all people what it feels like to be judged and out casted. For some reason the general public and even our own kind assume every cosplay lady should look like Mad Moxie or Lust literally… that is unfair to us as true enthusiasts. The best and most commen statement made about my play was “thanks for staying true to form” (ie: thanks for not slutting it up for no reason) My obvious response was why would I do that. What you and your partner do is take a piece of fictional art and bring it to life! You are well respected over many different fandom communities! And you look damn good doing it EVERY TIME! You are an inspiration to other players and are overall appreciated. Please don’t ever stop cosplaying, it’s an outlet for you and your creativity and you’re good at it! Let hater tears fuel your fire and don’t spend a moment letting their sad little lives darken yours. You’re not doing this for them, you’re doing this for you and that is beautiful and so are you. Your message is empowering, your rumination is identifiable. Everyone has those moments of doubt, I just hope you have more empowered days then days of doubt. I am usually quite confident, but this post made me tear up because this is exactly how i feel. And it feels nice that someone finally said it. It’s okay to not be okay. The country where i come from is surrounded by elitism when it comes to cosplay. These “elitists” usually puts down other people as they feel like they have the right to do it, even though everyone knows that no one has the right to criticise you and tell you that you should not cosplay this or that. I had one moment of this some time ago. I had planned to cosplay as malik al-sayf from assassins creed and one of these elitists sends me probably the longest message i have ever seen. It said that I am not _allowed_ to cosplay as him. (Okay uhm. I didn’t know that I need to ask for permission to cosplay someone nowadays from the “high class elitists”) and her reasoning was that because he is most probably a muslim (his religious or political views are never revealed in the game), he is missing an arm and he’s a person of colour. You are a white girl. If you cosplay as him, you are a racist bigot and that i will commit cultural appropriation. In a way i understood her point of view, eapecially if i would act offensively in this costume and if i would have black faced this character. But there is a fine line between these things. I felt like she was more racist than I was, but I don’t know, I’ll leave that to others to judge and think for themselves. In the end i did the costume, and i got loads of compliments for it, and people really liked it, and its one of my favorite costumes I’ve thus far. And I have behaved well in this costume, i haven’t brought up religious things at all during conventions (i think it’s common courtesy to not do that as someone really might get hurt and upset) and I acted as I always would, with respect for the others and with kindness and positivity. But of course, things like this hurts. It always does. And especially this country I come from our cosplay scene is very small, everyone knows everyone and there’s a lot of bullying going on. I tried to hold a panel about this ( cosplay bullying), but all conventions has refused as they feel like there is no need. So i feel rather helpless. But i try to keep my facebook page as positive as possible and try to stay as positive too in real life. Things like these of course stings and especially when you get called nasty things it always hurts. But as you said. Focus on the positive things.